Life continues to be a central issue in politics and news over the past month….and we couldn’t be happier! 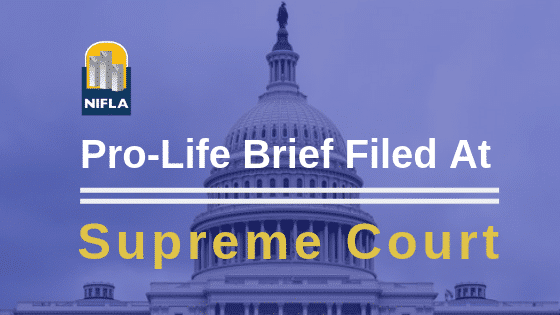 Last month NIFLA joined Americans United for Life as well as Care Net and Heartbeat International in filing a brief with the Supreme Court of the United States urging it to uphold an Indiana law which mandates that abortion providers offer women the option of viewing an ultrasound image of their child before deciding to have an abortion. In addition, the brief included thousands of physicians and other healthcare professionals represented by the American Association of Pro-Life Obstetricians and Gynecologists, the American College of Pediatricians, and the Christian Medical Association. “Women are smart — and NIFLA’s network of nearly 1,500 pregnancy centers nationwide takes pride in providing them with everything they need to make an informed choice. Read more details on this important case and the full statement here. The Movie Unplanned Premiered Nationwide—A Must See! On March 28 the movie Unplanned premiered in theaters nationwide. NIFLA President Thomas Glessner urged everyone to see this powerful and true pro-life story in his op-ed published in Fox News. Unplanned follows the journey of Abby Johnson who served as the director of one of the largest Planned Parenthood abortion clinics in the nation. It tells of her eventual conviction of the wrongness of abortion and how she bravely left her position in defiance of Planned Parenthood’s threats to destroy her if she did. This movie brings home the stark reality of the abortion industry and exposes the agenda of Planned Parenthood – the number-one provider of abortion worldwide. Don’t miss the opportunity to share this important story and promote the cause and culture of life in your community! According to The Hollywood Reporter, the movie surpassed expectations by landing in the box office top 5 for its opening weekend, grossing $6.4 million. Initial estimates had suggested an opening of around $3 million – which means the film essentially doubled what was projected. What an incredible witness for the pro-life movement! Click HERE to find a theater near you that is showing Unplanned. NIFLA is excited to cordially invite you to attend NIFLA’s National Legal and Medical Summit, May 20-23, 2019 at The Founder’s Inn, Virginia Beach, Virginia. This year’s Summit is shaping up to be a top-notch educational and training event for those dedicated to supporting the work of pro-life pregnancy centers. Lawyers who attend will receive up to nine (9) Continuing Legal Education units (CLEs) and nurses and other healthcare professionals will receive continuing education credits as well. NOTE: this event is not just for attorneys and medical professionals! Everyone who works at a pregnancy center is encouraged to attend. This includes pregnancy center board members, staff, and volunteers. The benefits you’ll receive from learning the latest pro-life legal and medical insights from premier experts will last a lifetime. Please visit our Summit website for more details on special speakers as they become available. We hope to see you at the NIFLA Summit for an unparalleled time of learning and fellowship. March was a great beginning to a spring-time of hope for the pro-life movement! Not only did NIFLA partner with several pro-life organizations to ask the Supreme Court to uphold a life-affirming Indiana ultrasound law, but Hollywood was taken by storm by a pro-life movie that rocked the box office. To keep riding the wave of pro-life activism, make sure to register for NIFLA’s Summit to learn more about the pro-life cause from a legal and medical point of view.